Tonight I ate a frozen burrito for dinner. It’s true. The fact of the matter is that during the week I eat like a total bachelor most nights, heating up something from my freezer or piecing together a meal out of whatever I can scrape together from the fridge and pantry which usually means hard-boiled eggs on toast or crackers and smoked salmon spread. Lately I’ve been juicing a lot of produce up and calling that dinner, but tonight I had no fresh fruit or juice-worthy vegetables (the thought of juiced Brussels sprouts is just not even remotely appetizing…) so that is where the frozen burrito came in. At least it was of the spinach and tofu variety so I managed to get vegetables into my day somehow. The memory of it almost makes up for tonight’s microwaved meal… almost. Preheat oven to 350 degrees. Place first 3 ingredients in heavy small plastic bag. Using meat mallet or rolling pin, crush spices. Transfer crushed spices to small bowl; mix in salt, ginger and cayenne. Toss potatoes, carrots and 3 tablespoons olive oil in large bowl. Sprinkle with salt and pepper. Arrange vegetables in single layer in large roasting pan. 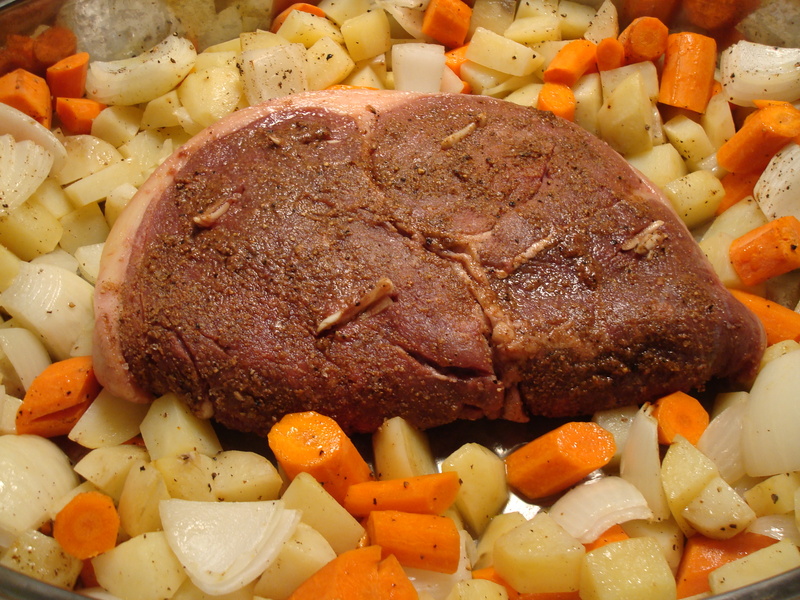 Roast about 30 minutes. Meanwhile, using tip of knife, make several slits in roast; insert garlic slices into slits. Brush roast with remaining 1 tablespoon olive oil. Rub spice mixture over roast. center of roast registers 125 degrees for medium-rare, about 1 hour. Transfer roast to platter. Foil to keep warm. Increase oven temperature to 450 degrees. 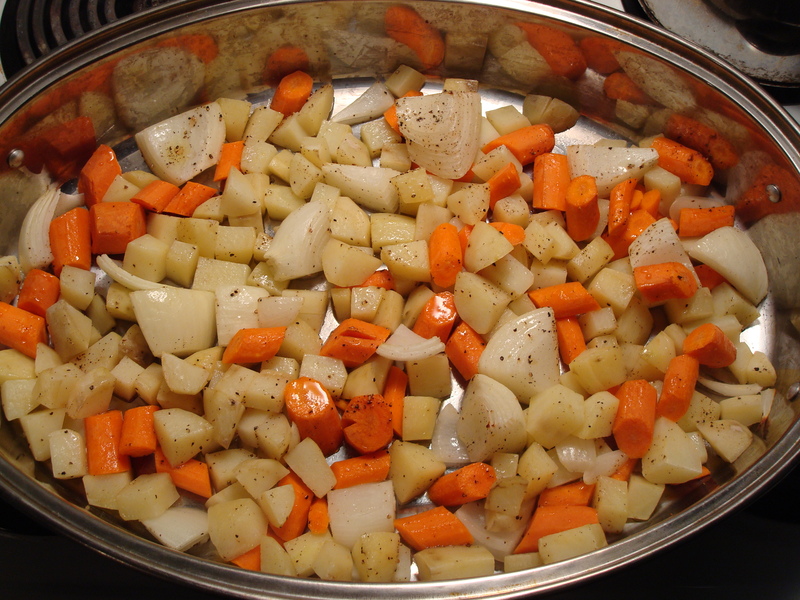 Spread vegetables in pan; continue roasting until vegetables are tender and brown, about 10 minutes. Surround roast with vegetables. 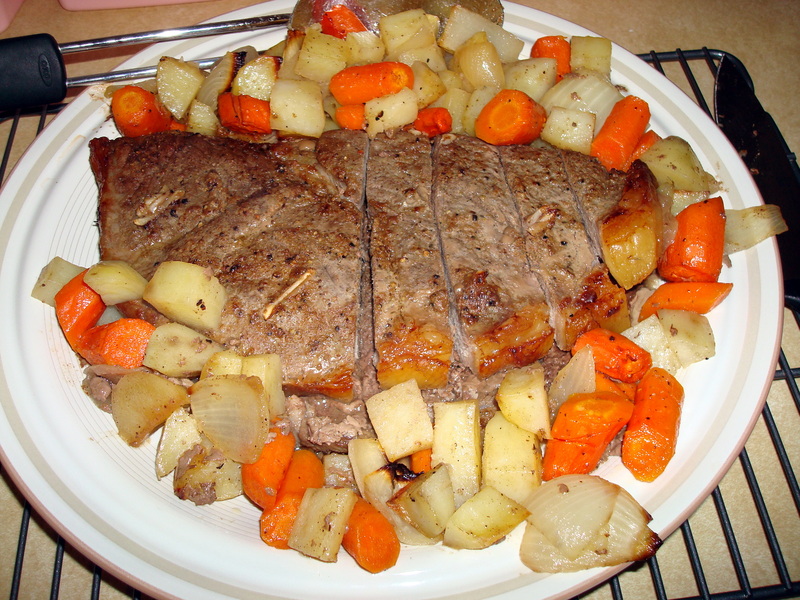 Cut roast into thin slices and serve.